Stretchy and slimy liquid that your respiratory organs secret has many names and comes in all colors of the rainbow. Mucus, phlegm or sputum is virtually the same thing that ranges in colors from clear to yellow, green, brown, bloody and even black. 1. Upper respiratory illness like cold or flu is one of the most common reasons for coughing up phlegm. Various viral and bacterial invaders irritate delicate nasal, bronchi and lung airways causing their swelling and accumulation of mucus that is needed to clear out the irritants and soothe inflamed tissues. 2. Bronchitis can develop from a simple cold and later progress to a full blown bacterial infection of the bronchi. Coughing up yellow mucus is one of the multiple symptoms of bronchitis along with chest pains, fever, chest congestion and throat mucus. WebMD advises to watch out for the symptoms of coughing up phlegm and call your doctor if your fever reaches over 102 F.
3. Pneumonia or inflammation of the lungs is one of the most serious reasons for coughing up phlegm. Various bacteria and viruses trigger pneumonia among people with weakened due to age or diseases immune systems. 4. Asthma is characterized by a series of recurring attacks or inability to breathe due to constricted airways. Inflammation present in airways causes significant mucus accumulation leading to coughing up phlegm. 5. Severe allergies to certain substances like dust, pollen, pet hair, foods, insect bites, and environmental pollutants result in body’s immune system exaggerated attempt to block these irritants. Body may produce large amounts of mucus that leads to cough, headache, congestion, swelling of skin and nasal passages. 6. Smoking causes chronic inflammation of the respiratory system organs leading to coughing up brown mucus on a regular basis, especially in the morning. Smoking makes you more prone to getting sick and later develop secondary infections of sinuses, bronchi and lungs due to increased production of mucus and phlegm. 7. Hazardous working environment puts you in danger of coughing up phlegm. Some of the most unfavorable occupations are coal miners, tunnel workers, marble polishing technicians, concrete workers. These people are especially prone to developing lung and bronchi diseases due to inhaling various toxic substances that are detrimental for their health on a regular basis. Coughing up black mucus is a common complaint among these workers that could be controlled by wearing special protective gear or masks. 8. Cystic fibrosis disease affects body to start producing excessive amount of mucus that literally over floods lung and bronchial passages leading to serious bacterial infections and constant coughing up green mucus. 9. Tuberculosis bacteria tends to affect individuals with severely compromised immune system and also underprivileged groups of the society living below poverty level, persons inhabiting overpopulated facilities like prisons and homeless shelters. 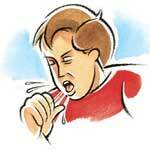 Coughing up bloody phlegm is a very well known symptom of this serious illness. 10. Gammaglobulinemia is a genetic disorder that results in body producing very little immune cells necessary to protect against diseases. Very often individuals affected by this disorder are susceptible to numerous upper respiratory viral and bacterial infections making them more prone to coughing up white chunks of phlegm.